Theodore "Sonny" Rollins was born in 1930 in New York City. He recorded with Bud Powell in 1949. The next year, he worked with Miles Davis and then quit, but rejoined in 1954, sounding less like Charlie Parker on a tenor saxophone and more original. 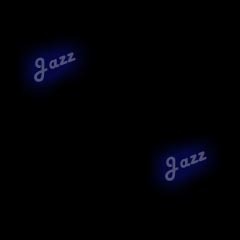 H then left jazz for a year in order to kick a drug habit. This was the first of many times that Rollins left jazz. He returned in 1955 and enjoyed his greatest success. He joined the Clifford Brown/Max Roach quintet, one of the two top hard bop groups of the Fifties. 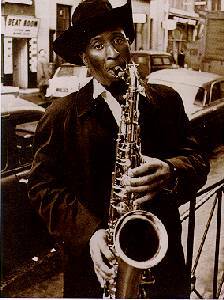 After Brown died in '56, Rollins creativity began to erupt, as he released a series of classic albums: Saxophone Colossus, Way Out West, A Night at the Village Vanguard, and Tenor Madness (whose title track is a duet with John Coltrane). He became the first tenor player of the Fifties to build on the substance, rather than the style of Lester Young. He revived "thematic improvisation" -- basing his solos not on chords (bebop) or modes (simplified scales), but rather on melody. His solos had a very solid "logic" to them. During this time, he recorded and composed classics, such as Pent-Up House, and the much analyzed Blue Seven. In addition to these, he also searched for jazz beyond the common 4/4 time, and this led him to record Valse Hot, a jazz-waltz. This led to further exploration into other time signatures by other jazz musicians (most notably Dave Brubeck). He returned in 1961 with more mastery of the instrument, but a more conservative style, but without a fresh breakthrough to offer. However, he couldn't ignore the changes in the musical landscape of the Sixties, so he hired trumpeter Don Cherry and drummer Billy Higgins, who both played with Coleman. Being the introspective individual that he is, he took two more sabbaticals, from 1963-65, in which he traveled to Japan and India to study yoga and 1967-72. He returned from the latter sabbatical using elements of fusion and free jazz, but he didn't turn out any legendary recordings. Sonny Rollins still records today, playing closer to the style from the Fifties. Sonny Rollins - A fan's tribute page.